CHARLESTON, W.V. (August 3, 2018) - A five-run sixth inning and Max Kranick's second consecutive quality start led West Virginia to a 6-2 victory over the Augusta GreenJackets Friday night at Appalachian Power Park. Kranick (3-4) retired the first 12 batters he faced for the second consecutive outing. The Pennsylvania native fanned eight GreenJackets while only allowing one run and three hits through six innings. 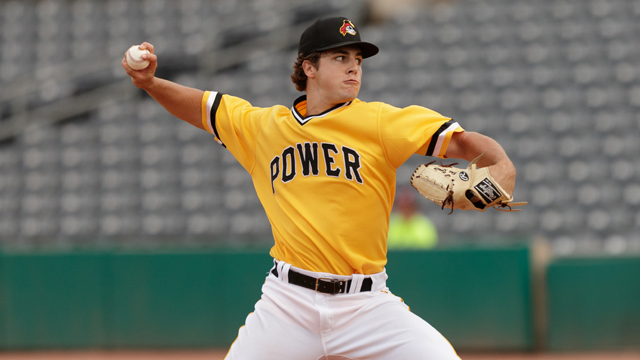 The Power (18-22, 55-51) could not crack Augusta (16-24, 53-55) starter Garrett Cave, who worked five scoreless innings while holding West Virginia to two hits. The next arm on the hill for the GreenJackets, Tyler Schimpf (4-3), did not fair as well. He allowed the first four batters he faced, Lolo Sanchez, Calvin Mitchell, Raul Hernandez and Robbie Glendinning to reach on singles, with Hernandez's base knock tieing the game at one. With the bases loaded, Rafelin Lorenzo skied a ball into the left-field corner that was snagged by Malique Ziegler, who leaned over the wall to make the grab for the first out of the inning. That sacrifice fly plated Mitchell to give West Virginia a 2-1 lead. Fabricio Macias followed that up with a sacrifice bunt that Schimpf could not field cleanly, bringing Hernandez home for the third run of the frame. Glendinning later scored on a throwing error by Rob Calabrese and Macias came around on a wild pitch to cap the five-run onslaught. Oneil Cruz added an insurance tally in the seventh after he smashed his 14th homer of the year over the left-center field fence to push the Power's lead to 6-2. Oddy Nunez (S, 1) twirled the final frames to pick up his first save of the season. West Virginia continues its four-game series with the Augusta GreenJackets Saturday night, with first pitch set for 6:05 p.m. at Appalachian Power Park. LHP Domingo Robles (8-6, 3.11 ERA) takes the hill for the Power, while Augusta counters with southpaw Caleb Baragar (0-1, 3.61 ERA). Pregame coverage begins at 5:45 p.m. on The Jock 1300 and 1340 AM, as well as online at www.wvpower.com and via the TuneIn Radio App and MiLB First Pitch App. Tomorrow is Back-to-School Night, presented by Todd Judy Ford. The first 1,000 people in attendance will receive a 2-in-1 backpack giveaway. Gates open at 5 p.m for the 6:05 p.m. contest. Be sure to get to the ballpark early to see Uncharted perform during Happy Hour at the Budweiser Dugout Bar from 5 to 5:30 p.m., with $1.00 12-ounce drafts available for purchase. The series concludes Sunday with Kidz Sunday Funday. Before the game, kids 12 and younger can play catch in the outfield, while afterwards, kids can run the bases, presented by the SMART529 College Savings Program, and select players will be available to sign autographs. For tickets and more information, call the Power at 304-344-2287 or visit wvpower.com.